Just a few things to wrap up the week. The first thing is that, in my last post, I wasn’t clear that my birthday countdown is a month long. It started May 27…so that means my birthday is at the end of June. Don’t you all worry, I will give weekly reminders of how many shopping days are left until my birthday. Maddie is holding steady. She has a good cough that really moves all that mucus junk around. She occasionally coughs some of it up, and the look of disgust on her face when this happens is priceless. We’re hoping that the steroids are working, but we’ll know more in a few days when the course is done. Last night she had another oxygenation study, but this time it was at home. I think it went just fine. She stayed in the high 90’s or at 100 for the whole night. Dr. Lung should review the results and get back to us ASAP. Most likely she will lower the amount of oxygen Maddie gets overnight, with the intention of weaning her off of it soon. Hopefully very soon. Fingers crossed. One of my coworkers has breast cancer, and she’s having a partial mastectomy on Monday. Today we all surprised her by wearing pink to show how much we love and support her. Coincidentally, she wore her shirt that says, “Save 2nd Base,” and a pink wig. I’d dared her to wear the wig for weeks now, so it was a dream come true for me. Anyway, we all decided it was necessary to take a picture of all of us in our pink glory, so in honor of second base, we went down to the local field for a photo. Good luck, D! You’re amazing. What an awesome photo. So nice that she has so many supporters. And I’m so happy Maddie is doing better. That picture is so great. I’m sure the support helps. I think anything that can make you feel less alone helps. I’m glad Maddie is not any worse. Hopefully she will progress and get off the oxygen too. You are on quite the roller coaster, aren’t you? Good luck! Good to know I’m not the only one who believes in long birthdays! Love the picture with everyone showing their support. That’s truly one to keep around! 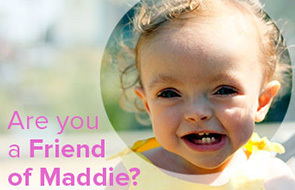 Fingers crossed that Maddie continues to progress. Nothing can ever be as easy as it’s supposed to, can it? I guess if a birthday countdown is a month long, I should have already started mine… Ah well.